Here is a fun little mini-mash batch I did to kill time while brewing a Foreign Export Stout (still waiting for carbonation). This is one of those ideas that I thought sounded great, but that I really did not want to end up with a case of if I was wrong. The real challenge on this recipe was to try to balance the flavor of the base beer along with the pumpkin, spices, cocoa powder, and vanilla. I went lighter on each one than I would have if I was just making a pumpkin beer, or a chocolate beer, but I was really shooting in the dark because I had never used many of these ingredients together. I was pleased with the way it came out, maybe next year I will do a larger batch. There is a good deal of debate in the homebrewing community over whether or not pumpkin needs to be mashed, or if it can simply be added to the boil. For my only other pumpkin beer I roasted a sugar pumpkin, took the skin off, pureed it, and added it to the mash. Not only did this get me my one and only stuck sparge but also didn't yield much pumpkin flavor in the finished beer. The disadvantage of adding the pumpkin straight to the boil is that the starch it contains will not be converted to sugars like it would be in the mash. However, Libby's Pumpkin Puree (fresh would be similar) contains about 2 oz of starch for every 3 lbs, so it isn't a huge amount. Appearance – Nearly opaque pitch-black, but dark brown edges when held up to the light. The head is light tan and thin, but a thin ring of foam stuck around for the duration. Smell – The spices, nutmeg and ginger, are the most prominent. There is a whiff of chocolate muffins following that up as well. After my nose gets used to the spices I also get a hint of toastiness and roastiness from the porter base, with some creaminess (similar to a milk stout). Taste – Again the spices lead the way, but they certainly are not over the top. There is a bit of pumpkin/squash flavor as well. The chocolate is rather subdued, but I definitely get it in the finish. Pretty good balance between the different elements, but a bit more chocolate would probably work well. No hop bitterness to speak of which leaves it a bit sweet, but I think the sweetness compliments the dessert elements. Mouthfeel – Full body with medium-low carbonation, just what I was aiming for in a fall beer. Drinkability & Notes – Pretty tasty, and easy to drink because of the balance. I think the unfermentables in the malt extract do a good job contributing to the body and sweetness. I like it more than the “standard” amber-pumpkin ale concept. 0.13 oz. Galena @ 60 min. The base beer was based on Denny Conn's BVIP (Bourbon Vanilla Imperial Porter), and the concept was inspired by Midnight Sun's Imperial Chocolate Pumpkin Porter. Steeped the grains in cheesecloth in 1 gallon of ~155 degree water. "Sparged" the bag with the final runnings from my Foreign Export Stout (you could use water if you don't have any final runnings sitting around). Gravity from grains 1.013 in 1.75 gallons. Added DME before boil started. Pumpkin added to the boil at 15 min remaining. Cocoa powder and spices rehydrated in a bit of wort and added for last 3 minutes of the boil. Undershot gravity and overshot volume considerably. Chilled down to 74 and put into the chest freezer at 55 degrees. Waited 4 hours, then aerated and pitched yeast from my Pale Brown Porter. 10/19/08 After 1 week in the mid-low 60s dropped the temp to 58 for the hefe and added 1 split vanilla bean. Lots of trub visible. 10/29/08 Bottle with 1/2 tsp of demerara per 12 oz bottle. Tasted alright, chocolate was the most prominent flavor at bottling. Tell me about your FES. Full post should come in the next week or so. If you can't wait, email me and I'd be happy to send along the promash file. I have also used the Libby canned pumpkin and fresh. I have found that a 10 lb. fresh pumpkin gutted, roasted, and mashed pulls through better than the canned. But you are dead on about starch conversion. How do you properly manage the sweetness of the cocoa? If I brew a full batch next year I will certainly give fresh pumpkin another try. I'm not sure I understand your question on the cocoa. I used unsweetened cocoa powder, so there was no sweetness to manage. I would avoid using anything labeled “hot chocolate” since they contain things besides cocoa powder. Some people suggest a little lactose in this type beer...I've also seen some suggest molasses. I guess lactose may or may not really meld well with the spices and/or chocolate, though. 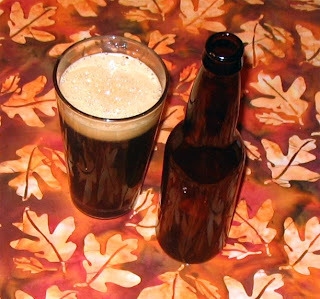 When I did my Pumpkin Porter last year, I did use molasses and Brown Sugar. Granted, that's probably not necessary with the more exotic grain bill compared to my recipe, but where do you stand on these? I like the chocolate addition, and would enjoy the vanilla as well. I know the alaskans are big on this style and the rest of the world hasn't caught on, but I love pumpkin porters. I just finished up a coffee oatmeal pumpkin porter, with mixed results. A smaller batch for same reasons as yours. it's a curious little brew, and I find no record of anyone ever trying it before. The levels were a little off and it could've been maltier. Also, since I've never commented before, and we share some amount of interest in Belgians, it'd be fun to see what you might have in store for a take on the Belgian Christmas ales, my favorite being the De Dolle. The first pumpkin beer I did had both lactose and molasses, but it was a pale base beer. I agree that those unrefined sugar flavors could go well with both the chocolate and the pumpkin, although I would try to keep it at that “adding complexity” level, just at the flavor threshold. I also think that lactose is a good idea if you are concerned about the beer getting to thin/dry. However, in a beer with this many malts and other ingredients I wanted to try to leave it as simple as I could. The Dark Saison I posted about a few weeks back is as close as I have come to a Belgian x-mas beer. Between the rosemary and the orange it certainly has a bit of a holiday flavor, but certainly a very different beer than Stille Nacht. It will be a few more weeks before it is ready for a full tasting, but it is coming along very nicely. I have a hard time imagining a coffee pumpkin combination, but I guess people do drink pumpkin spice lattes and the like. All of my carboys are occupied by a couple lagers and a couple ciders at the moment, so not much more brewing for me in the next 6 weeks or so. First off, I really enjoy your site. I stumbled upon it, probably through Google and have been a reader ever since. I have a question about the use of demerrara in bottling. I just brewed a cherry vanilla smoked stout, and I used demerrara for ~10% of the fermentables. I hadn't thought of using it again for bottleing, but now I'm considering it. You give an amount per bottle, do you just scoop the dry sugar into each bottle? My only concern is infection, as I have always boiled my priming sugar. Not that I couldn't do the same here. Cheers! Hi! I'm very interested in this recipe but have questions about converting to all grain. How do I convert DME to Maris? Why is your efficiency so low? Would you still mash for 30 minutes? Coincidentally (seven years later) I brewed an all-grain follow-up to this recipe last weekend! This recipe was based on second runnings, thus the low efficiency. Mash length depends on many factors, but most of my batches get 30-45 minutes to convert. No harm in going longer. After four hours the wort likely wasn't down to 55 F, that was the ambient temperature. If you can, chill to the mid-60s, aerate, and pitch immediately. Stellar! Are you going to post it? 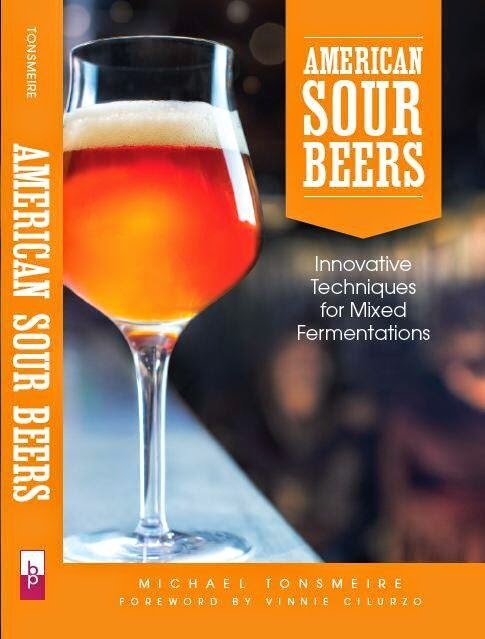 Thanks too for the American Sours book. I learned a ton and it was quite enjoyable to read. So far I had great success with your Berliner Weise recipe. Of course, assuming the batch isn't terrible! Glad the book has been a help! Which ratio cocoa powder/water for your cocoa paste ? About 5:1 water to cocoa powder should do it. You can use more without issue (if you don't mind the extra water).